Cast to TV, a GNOME extension to cast videos, music and pictures to Chromecast or other devices over the local network, has been updated to v8, with some important additions. For all the functionality that Google Chromecast brings to the table, casting content from browsers other than Google Chrome isn’t one of them. Google officially supports streaming content from Chrome’s browser tabs to Chromecast, and even makes it dead simple to do so. All you have to do is click the 3-dot Chrome Menu icon and select “Cast..” However, if your browser of choice is not Google Chrome, you were out of luck. 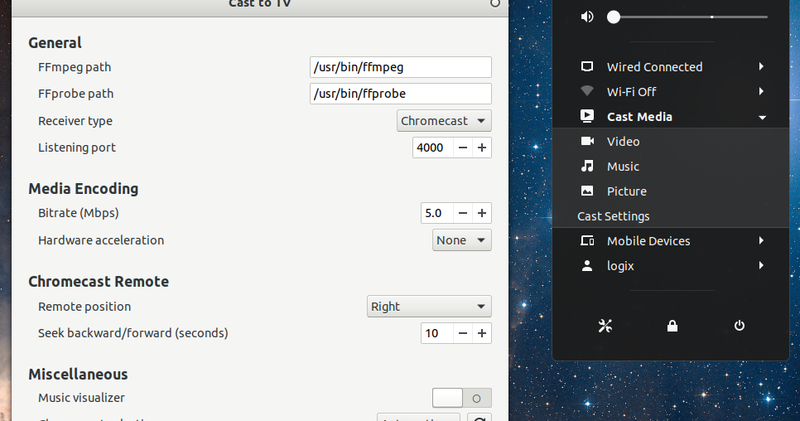 A new, open source, experimental Firefox extension called fx_cast brings the ability to cast from Firefox to Chromecast. The extension implements the Chrome Sender API and exposes it to web apps to enable cast support. You do need a bridge application on the OS (Windows, Mac, or Linux) to handle communication with receiver devices. Once both are installed, all you have to do is click on the new cast button that has been added to the toolbar, and you should be able to start casting content from websites as well as videos from YouTube and Netflix right from Firefox itself. Explicación de como podemos usar #Raspicast para transformar nuestra #Raspberry Pi en un #Chromecast capaz de reproducir vídeos, audio e imagén.